I am quite a routine person. If I do something I want to do it according to how I feel is the right way. Every dinner has its rules with a specific set of side dishes, the laundry has to be done in a certain way, and even my blog posts need to be made in a specific way. The list goes on and on but I will spare you. I haven’t really had the possibility to do things my way since my daughter was born. The last shred of chance got thrown out the window when my little boy was born and had silent reflux. I have been forced to lower my standards quite severely and I am usually just hanging in there to survive and trying to avoid plans. This might be an slight overstatement but this is really how it feels at times. My dinners have truly been compromised to the minimum and as you might have seen I don’t blog very often. It has been a rough winter full of illness, sleeplessness and chaos. Maybe more on that some other day. One thing stopping me from blogging the few things I have made is photos. There has simply not been a chance to try to take any good photos and I feel bad uploading bad photos. I have been working on another blog entry for few months now and just don’t seem to really get there. Last Saturday I thought I finally had a chance to do something right. 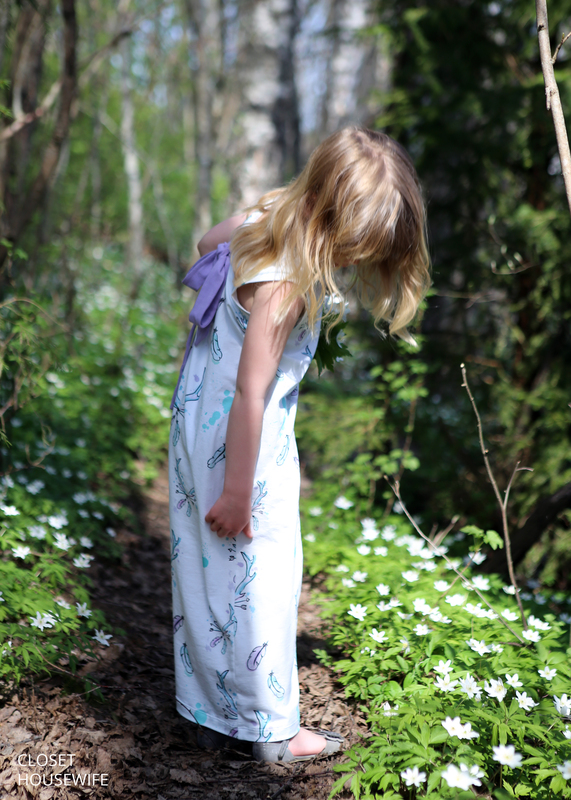 My little boy was sleeping, his dad was at home watching him, and my daughter was set on going to the forrest to take some photos of her in her new dress with all the white spring flowers (wood anemones). Even the camera was charged and honestly it all just felt too good to be true. We walked along a little forrest path close to our house holding hands. 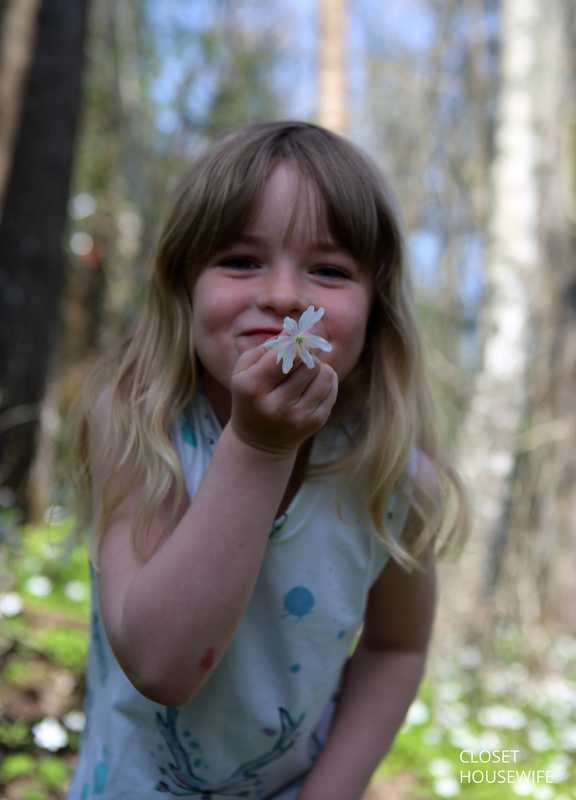 My little girl started picking flowers and I started fiddling with the camera settings and taking photos. All very peaceful and beautiful. Then it hit. I hadn’t even managed to get the settings right before we got interrupted by a vicious ANT that attached itself to my daughter’s foot and made us having to flee the forrest screaming. Well she was screaming out loud and I was screaming inside of me in frustration. Any hopes of going back were quickly put to rest by a little angry girl exclaiming she was never gonna go back there in open shoes. The thought of a dress with rubber boots really didn’t feel appealing to my rigid blog photo standards so I figured I would just have to live with the photos I had caught so far. So here they are! 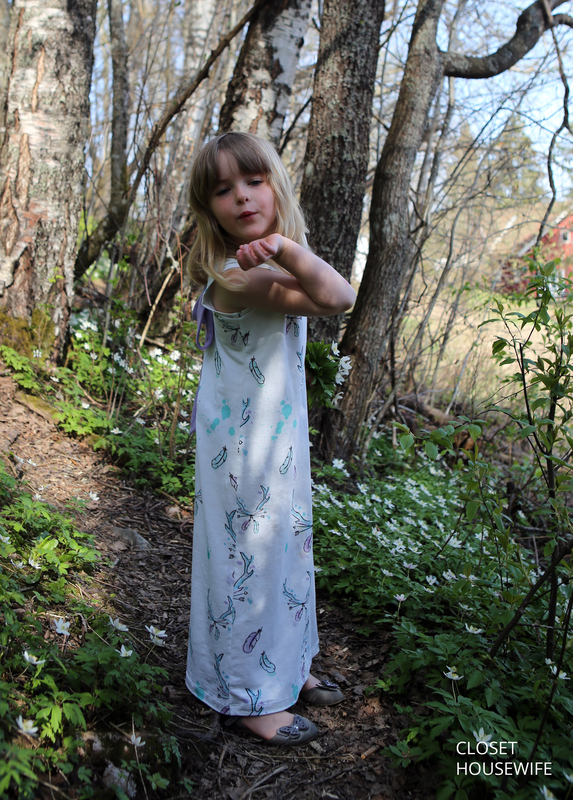 The dress is Laaaang kjole (Loooong dress) from Fam Irvoll’s book Sy Klær til Kidsa. 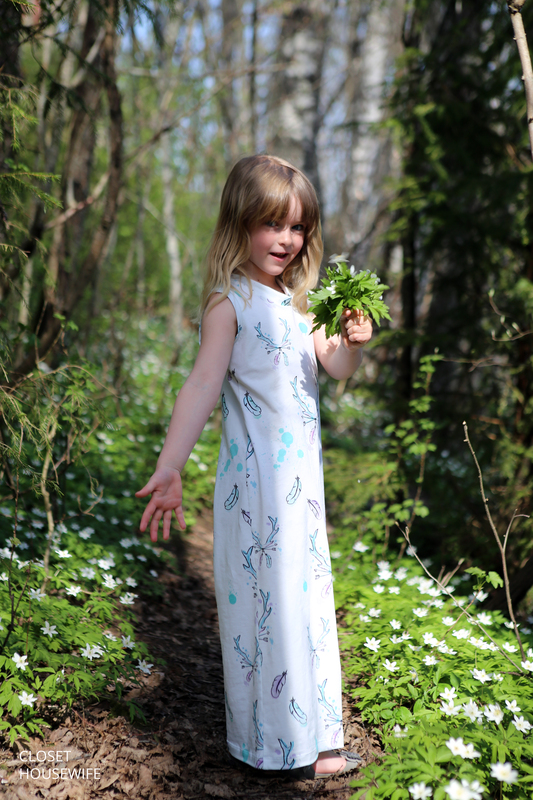 My daughter really wanted a long dress and this was the perfect pattern. The pattern was quite easy to follow and I like the shape. Size six was a bit on the longer side but we shortened it a bit and all was well. 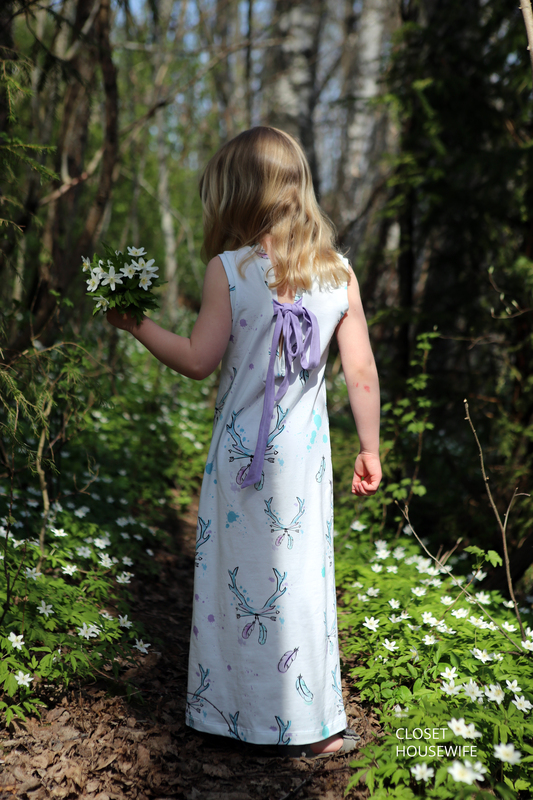 The fabric is Spirit of Nature jersey bought from Kjekk og Søt and the lavendel jersey in the ribbon is from Olivias. Adorable dress, I bet your daughter loves it, I know mine would! Thank you! Yes she does indeed love it 🙂 .